Chronic kidney disease (CKD) is a lifelong condition. The kidneys gradually stop working as well as they should. This usually happens over many years. In stages 3b to 5 CKD – the later stages of CKD – many children start to have symptoms as their kidney function is reduced. These symptoms are different for each child with CKD. Water and salts can build up in the body, which may lead to swelling and high blood pressure. Some children get more tired than usual, feel sick (nausea) or are sick (vomit), cannot or do not want to eat as much, and may not grow as well. Your child’s healthcare team will make sure your child gets the right tests and treatments at each stage of the disease, and regular assessments to check that he or she is growing well. Your child may need to take some medicines to treat the symptoms – changing the types or doses of medicines as needed. He or she may need to eat a different diet and drink fewer or more fluids (such as water and juice), and may need to use a feeding tube. You will have lots of support to make sure your child gets the right nutrition. Your child’s healthcare team will talk to you about any other treatments that may benefit your child. CKD is a complicated disease. You and your child will learn more over time about how to help manage the condition and what to expect. While it is not possible to recover from CKD, specialist care will help your child live as full and healthy a life as possible. This topic describes the symptoms, complications and treatment of children in later stages of CKD. This is normally defined as stage 3b to stage 5. For more general information about CKD, please first read Chronic kidney disease – introduction. The kidneys are bean-shaped organs. They filter blood and remove extra water, salt and waste in urine. Most of us have two kidneys. They are at the back on either side of our spine (backbone), near the bottom edge of our ribs. There are five stages of CKD. Stage 3 is often split into two – stages 3a and 3b. The stages are defined by the glomerular filtration rate (GFR). The GFR measures the volume in millilitres (mL) that the kidneys filter each minute (min). This is adjusted for your child against a standard adult body size, which has a surface area of 1.73 square metres (m2). The GFR tells us how much blood the kidneys filter per minute – and how well the kidneys are working. This gives us an idea of the kidney function. The GFR for kidneys that are working at 100% (healthy kidneys) is 90 mL/min/1.73 m2. The GFR for kidneys that are working at 50% (half as well as healthy kidneys) is 45 mL/min/1.73 m2. Many children with CKD do not progress through all stages. Other children do reach stage 5, but how quickly this happens is different for each child. Some do not reach stage 5 CKD until adulthood, when they will be treated by a nephrology unit that treats adults with kidney conditions. CKD is very rare in children. It is caused by a number of conditions that affect the kidneys. Some of these are present at birth, and others start later in childhood. Not all kidney conditions cause CKD, and not all children with CKD progress to later stages. Although the conditions are different, if they lead to CKD, the kidney function may get worse over time. In later stages of CKD, the kidneys are less able to filter blood and make urine. This means they are less able to remove waste products and control the amount of water and important chemicals in the blood. They are also less able to keep the blood’s pH balance (or acid–base balance) constant, which is important for health. The kidneys have other jobs. These include controlling blood pressure, keeping bones healthy and strong, and stimulating the bone marrow to make red blood cells to carry oxygen round the body. Good kidney function also helps make sure children grow and develop normally. These jobs may be affected in later stages of CKD. • a paediatrician – a doctor who looks after babies, children and young people with different health conditions. Your paediatrician may be in your local hospital or another setting in your area, such as a community clinic. However, your child will start going more regularly to the paediatric renal unit, a specialised unit for babies, children and young people with kidney conditions, which may be in a different hospital to your own. • play specialist – a professional who uses dolls and other toys to help your child prepare for procedures such as blood tests and dialysis. • What treatment will my child need, and when? • How will the treatment help my child? • How can I help my child prepare for tests and treatments? • How will you know whether or when my child will need dialysis and / or a transplant? Your child will need to return to the hospital for follow-up appointments and blood tests. These will measure his or her kidney function and check for any complications. It is important to go to all appointments even if your child feels well. If you cannot go to an appointment, please speak with your child’s healthcare team to arrange another date. Your doctor or nurse will regularly review the medicines that your child is taking. The doses (amounts) or types of medicines may need to be changed, depending on your child’s needs and how he or she is responding to treatment. • Speak with your doctor, nurse or pharmacist before giving your child medicines, including herbal medicines, or trying any types of complementary therapies. This is to make sure that these do not interact with your child’s treatment. • Dot not give a type of medicine called non-steroidal anti-inflammatory drugs (NSAIDs) such as ibuprofen (e.g. Brufen, Motrin or Nurofen) or diclofenac, without speaking with your paediatric nephrologist. • If you are unsure about a medicine, ask your doctor or nurse what it is for and whether there are any side-effects. • Keep an up-to-date list of all the medicines that your child is taking including the doses. Your child should carry this with him or her in case of an emergency. It is important that you follow your doctor’s instructions on how much to give and when. Some children start to urinate (wee) less often, or pass less urine, or occasionally no urine. After some time, this leads to a build-up of water and salts in the body – fluid overload. This may cause swelling or puffiness in your child’s body – oedema. It may also cause your child’s blood pressure to rise – this is called hypertension. • Medicines: sometimes, medicines can help remove more water in the urine and/or control blood pressure. • Fluids: often, children need to drink less fluid (such as water and juice) and eat less food with a high amount of water (such as soups and porridge). Your child may feel very thirsty at first – eating less salty food can help reduce thirst and helps control blood pressure. Your doctor will let you know how much fluid your child can drink. A paediatric dietitian can help you plan meals. In other children with CKD, the kidneys cannot make concentrated urine. Instead, there is too much water in the urine. These children pass lots of weak urine, which looks lighter in colour. These children often need to drink lots of fluids to make up for the water they are losing in urine. If your child passes a lot of weak urine and has diarrhoea or vomiting (being sick), speak to your doctor because he or she may be at risk of dehydration (not enough water in his or her body). All babies, children and young people need to eat a healthy, balanced diet to grow and develop. Children in later stages of CKD may develop a poor appetite, and not be able to eat as much. They may feel sick (nausea) or be sick (vomit), be more tired than usual and have low levels of energy. A few children with CKD develop a high level of cholesterol (a fat) in their blood. • Diet: your child will probably need to follow a special diet to help make sure he or she gets the nutrition he or she needs. • Nutritional supplements: your child may need to take nutritional supplements – drinks, powders, tablets or liquid medicine – to get the nutrients he or she cannot get from food. • Feeding device: if your child cannot eat enough, he or she may need a feeding device. This uses a tube, placed in the nose, or sometimes through the skin, into the stomach, to give nutrients (and sometimes medicines). The kidneys control the production of red blood cells, one type of living cell in the blood. Red blood cells have a substance called haemoglobin, which carries oxygen around the body. In later stages of CKD, there may be a drop in the amount of red blood cells and haemoglobin – this leads to anaemia. Children with anaemia often feel weak and tired, and may look paler than usual. Your child may need some medicines. These may include folic acid, and/or erythropoietin (EPO), which is injected with a needle. They may also need iron, which can be taken by mouth or given by injection. In CKD, the kidneys are less able to remove phosphate and potassium, chemicals that are found in many foods. This can lead to high levels in the blood, called hyperphosphataemia (too much phosphate) and hyperkalaemia (too much potassium). CKD can also lead to low levels of calcium, another important chemical in the body – this is called hypocalcaemia. The kidneys are less able to control the levels of calcium and phosphate and to activate vitamin D – these are all needed to keep bones healthy. Children may develop renal bone disease (renal osteodystrophy) – the bones become less strong, and may not grow normally. Some children have no symptoms, but some have pain in their bones or joints, and are at risk of bone fracture. This is a very rare complication, and does not normally happen if your child follows medical and dietary advice. Hyperkalaemia can cause the heart to suddenly stop working properly. Your child’s healthcare team will check your child regularly and tell you how to stop this from happening. • an imbalance (wrong amounts) of calcium and phosphate – after many years, this causes the blood vessels to get stiff and develop problems with blood circulation. Cardiovascular disease is the most common cause of death in adults with late stages of CKD. To reduce these serious risks – both in childhood and later in life – your child needs to carefully follow the treatment plan set by your doctor and dietician. This will probably include restricting which foods he or she can eat and taking medicines. It is crucial to do this – especially because there may be no symptoms. Stage 5 CKD is also called established renal failure (ERF) or end-stage renal failure (ESRF), when the kidneys cannot support the body. Your child’s healthcare team will help you prepare for the treatment needed at this stage, throughout the disease. • Dialysis: some children need dialysis, which uses special equipment to remove waste products and extra water from their body. This may be needed if your child needs to wait a long time for a kidney transplant, or if your child goes into stage 4 or 5 CKD quickly. • Kidney transplant: this is currently the best treatment for ERF in children, in which a healthy kidney from a donor is transplanted into their body. Sometimes this can take place before a child needs dialysis. This can be a difficult and stressful experience for your child and the whole family, including other siblings. You and your child will learn more over time about how to help manage and live with CKD. Your child’s healthcare team is there to help you. They can provide support with your child’s education, accessing financial benefits and planning holidays around tests and treatments. Speaking with other families of children with CKD can also be a huge support. Older children and teenagers may need to start taking more responsibility to manage their health. Your son or daughter may want to learn more about CKD, take his or her own medicines, and speak with the doctor or nurse on his or her own. You will find the balance that works best for you and your child. If you need more support, talk with the healthcare team. CKD is a lifelong disease. Unfortunately, there is no cure. Your child’s healthcare team will do what they can to help ensure the best and most suitable treatment, so he or she can live as healthy and fulfilling a life as possible. When your child reaches teenage years, he or she will prepare to transfer from paediatric services (for children) to adult services. The timing is different for each person – though many will start being looked after by an adult nephrology unit by the time they are over 18 years old. Many units have a transition programme, which starts some years before the transfer, to help adolescents to prepare. Your child will need to take care of his or her health throughout life. As an adult, he or she will be supported by a new team. He or she should be encouraged to live a full and fulfilling life and go on to further education, working and having a family, etc. Your child will need to return to the hospital for follow-up appointments and tests. These will measure his or her kidney function (how well his or her kidneys are working) and check for any complications. Your doctor or nurse will also review any medicines that your child is taking. The doses or types of medicine may need to be changed, depending on your child’s needs and how he or she is responding to treatment. You will have an opportunity to ask any questions. At these appointments, your child will be assessed, including having his or her height and weight measured, to find out whether he or she is growing well. Your child will also have blood pressure measurements – to check for hypertension (high blood pressure), or find out how well any treatment to control blood pressure is working. Urine tests check for protein in the urine (proteinuria). You, or a nurse, will need to collect some of your child’s urine in a small, clean container. A dipstick will be dipped into the urine – this is a strip with chemical pads that change colour depending on what substances are in the urine. Your doctor or nurse will give you any special instructions, as you may need to collect your child’s first morning urine (the first urine he or she passes after waking) and/or do urine tests at home. Your child will have regular blood tests. These look for the following. • Urea – a waste product that the body makes from the food we eat. In CKD, this can build up in the blood stream, causing uraemia, which may cause children to feel tired and sick. If the levels of urea are very high, they may cause seizures (also called convulsions or fits). • Creatinine – another waste product, which is made from our muscles. This is tested to measure kidney function. • Parathyroid hormone (PTH) – the body makes this hormone to keep bones healthy. The PTH levels will be measured to find out whether your child is at risk of renal bone disease (renal osteodystrophy), when the bones become less strong. calcium is important for bones and teeth, helps blood to clot, and also helps the muscles, including the heart muscle, to work. Calcium levels may decrease in CKD. • Tests for anaemia – children with CKD may develop anaemia because they have too few red blood cells or less haemoglobin, a substance that is in red blood cells. Because red blood cells and haemoglobin carry oxygen round the body, children often feel weak and tired and may look paler than usual. Blood tests check for the amount of iron and haemoglobin. • Fats (including cholesterol) – this test looks at types of lipids, which are fats, in the blood. Your child may need more specialised tests. Your child may need to be admitted to the ward at your paediatric renal unit for these (a specialised unit for babies, children and young people with kidney conditions, which may be in a different hospital to your own). • A more accurate test of kidney function, using a radioactive tracer. See Blood tests for more information. • Kidney biopsy – a tiny piece of one kidney is removed from the body with a needle, and examined under microscopes. Special medicines are used so your child does not feel any pain or can sleep through the procedure. A kidney biopsy can give more information about how much damage there is in your child’s kidney. It can take a few weeks to get the results. 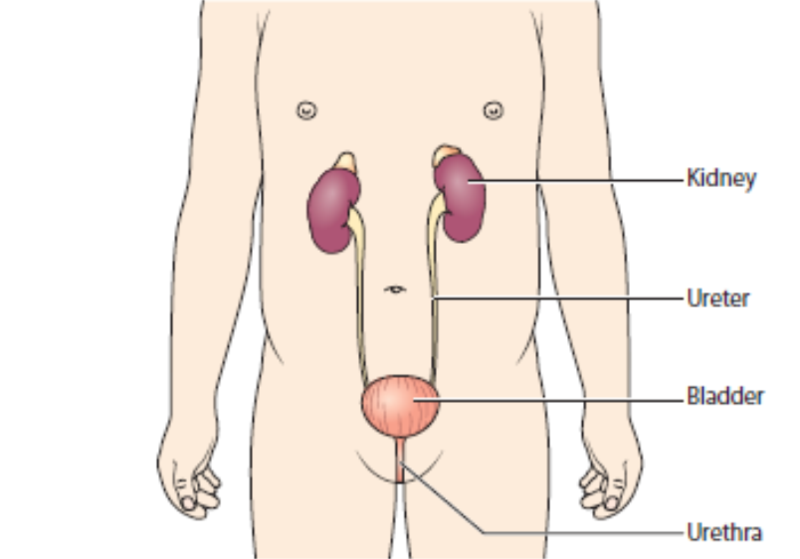 In later stages of CKD, the kidneys are less able to filter blood and make urine. Some children start to urinate (wee) less often, or pass less urine (this is called oliguria). Occasionally, they cannot pass any urine (anuria). After some time, this leads to a build-up of water and salts in the body – this is called fluid overload. When there is more water than usual in the blood vessels, this causes the blood pressure to rise – hypertension. In some children, the fluid overload can cause swelling or puffiness in their body, especially around their eyes and in their legs and feet – this is called oedema. Your child will have regular assessments for fluid overload. Your healthcare team may talk about target weight or dry weight. This is an estimate of what your child’s weight would be if he or she did not have fluid overload. This allows the healthcare team to decide on any changes to the treatment. • eat smaller amounts of food with a high amount of water (such as soups, porridge). It can be difficult at first to know which foods have a high amount of water, and which your child can and cannot eat – but you will quickly learn. Your healthcare team – which may include a community nurse and/or a paediatric dietitian – will give you advice and help you design meals for your child. They may also provide measuring cups to help make sure your child gets the right amount to drink. Your child may feel very thirsty at first – eating less salty food can help reduce thirst and helps control blood pressure. This is different to advice for children who do not have CKD – who should drink plenty of water to avoid being dehydrated. There are also some types of CKD where the child needs to take MORE water than normal. Please make sure you understand how much fluid your child should take in. If you are unclear, please ask your doctor. Your child’s doctor may prescribe medicine to control or reduce his or her blood pressure, in order to treat hypertension. There are many types of medicines used to treat hypertension in children. Your doctor will prescribe the medicine that they think is best for your child. All babies, children and young people need to eat a healthy, balanced diet to grow and develop. Children in later stages of CKD may develop a poor appetite, and not be able to eat as much. They may feel sick (nausea) or be sick (vomit) because of the effects of CKD and/or the medicines they need to take. They may also be more tired than usual and have low levels of energy. Your child’s healthcare team will look out for these signs. The kidneys are less able to control the amounts of vitamins, minerals and other chemicals that are important for our health. Having too much or too little of certain chemicals may cause complications. Rarely, children with CKD develop a high level of cholesterol and/or triglycerides, which are fats in the blood, even with a healthy diet. Your child will have regular blood tests to monitor this. It is important that your baby or child with CKD feeds or eats well. Good nutrition is essential for their growth and healthy brain development. It gives children with CKD strength to fight illness and infections. Some children with CKD struggle with eating. They will need extra support to make sure they get the energy and nutrients they need to grow and stay healthy. Your child will probably need to follow a diet that is specially designed for him or her. This will include restricting (or sometimes avoiding) certain foods that have a high amount of some electrolytes, because the kidneys are less able to remove them into urine. Your child will have regular blood tests to find out the levels of these electrolytes. As your child’s kidney function gets worse, he or she may need a more restricted diet. Your paediatric dietitian will help you design meals that are right for your child. It can be difficult at first to know which foods have a large amount of these nutrients, and which your child can and cannot eat – but you will quickly learn. The diet that your child needs may be very different to the healthy eating advice for children who do not have CKD. Eating less salt may be good for the whole family. However, make sure that other children continue to eat a normal, balanced diet. To make sure your child has enough protein and energy, and the right vitamins and minerals, he or she may be prescribed one or more supplements. These may be made up as a drink, as powder or granules to mix into water or squash, or as a tablet or liquid medicine. They are just as important as medicines, and need to be taken as your doctor or dietitian advises. We get vitamin D mostly from sunlight on the skin, but it is also in some foods (such as oily fish, eggs and breakfast cereal with added vitamin D). The kidneys are needed to convert this vitamin D into a form the body can use. Activated vitamin D helps control the amount of calcium and phosphate in the blood, and so help keep bones and teeth healthy. In CKD, the kidneys are less able to activate vitamin D. Many children need to take supplements with a form of vitamin D that the body can use. If your baby or child is unable to eat and drink all he or she needs to grow and develop, he or she may need a feeding device. Some, or all of your child’s nutrition, and water and medicines, can be given through a tube. This is often called tube feeding. It is different from oral feeding, which is by mouth. Your child’s dietitian can discuss this with you in more detail. There are several types of device, with different advantages and disadvantages. Your doctor will discuss these with you before a decision is made. • Nasogastric tubes are normally for short-term use. They are long, thin tubes that are placed through the nostril, down the throat and into the stomach. The feeds are given through the tube to get to the stomach. Sometimes the child pulls the tube out and it needs to be replaced. After training, most parents and carers are able to replace the nasogastric tubes themselves. • Nasojejunal tubes are occasionally used instead. These are long, thin tubes that are placed through the nostril, down the throat and into the small intestine (just past the stomach). • Gastrostomy is sometimes considered for long-term use. In this procedure, a small hole (called a stoma) is made through the abdomen’s (tummy’s) skin and into the stomach. Feeds are given through a gastrostomy button or a gastrostomy tube – the gastrostomy tube can stay in for years if needed. The gastronomy tube and button do not become easily dislodged. It is also more discreet as it cannot be seen when the child has clothes on. There are two ways to feed your child, using either a nasogastric tube or a gastrostomy. Both can be done at home. • Bolus feeds are done at regular times of the day. A syringe is attached to the feeding tube or button. The feeds flow by gravity into your child’s stomach, for 15–20 minutes each time. • Pump feeds are done for longer periods of time and at a slower rate. An electric pump is attached to the feeding tube or button, and the right amount of feed is slowly given over the set time – this is usually overnight but can be over 24 hours. Occasionally, medicines that help reduce the amount of cholesterol or other fats may be needed. These are usually statins, medicines that reduce the amount of cholesterol the body makes. CKD may affect your child’s growth. Your child will have regular blood tests that check the levels of some hormones, chemicals that are carried in the blood to send messages to other parts of the body. He or she will also be measured and weighed, and may have X-ray tests to find out how he or she is growing. Your child may be referred to a paediatric endocrinologist, a doctor who specialises in treating children with hormone problems. The endocrinologist can examine your child and may need to arrange more tests, such as special blood tests, to find out more. Hormones called growth factors help the body to grow. In CKD the levels of growth factors may be normal, but may not be producing normal growth. Some children with severe CKD may need extra growth hormone as a medicine. This needs to be injected under the skin once a day. You may be given information about how to give the injection at home. Many children learn how to administer it themselves. Some children experience side-effects when taking growth hormone, though these are very rare. They may include headaches, visual problems, nausea and vomiting, and puffy legs due to more fluid retention. If you are concerned, speak with your doctor. The kidneys control the production of red blood cells, one type of cell in the blood. Red blood cells have a substance called haemoglobin, which carries oxygen around the body. In later stages of CKD, the amount of red blood cells and haemoglobin often drops – this causes anaemia. • looking paler than usual. Most children will need to take iron supplements because they do not have enough iron in their body and are unable to get enough iron from food. Iron helps the body to make more haemoglobin. Some children (especially children on haemodialysis) may be given iron intravenously (into a vein) during the dialysis session. Some children benefit from taking folic acid supplements. Folic acid helps the body make more healthy red blood cells. The kidneys make some of our body’s hormones, chemicals that are carried in the blood to send messages to other parts of the body. When the body does not have enough red blood cells, the kidney releases a hormone called erythropoietin. This hormone causes the bone marrow to produce more red blood cells. As the kidney function gets worse, the kidneys are less able to make this hormone, which causes a drop in healthy red blood cells. Erythropoietin – which is often shortened to EPO – can be given as a medicine, to help the symptoms of anaemia. It needs to be injected with a needle under the skin – usually one or two times per week. A special gel or cream can be used to help your child stop feeling any pain. You may be able to give these injections at home, using pre-filled syringes or pens – you will be shown how to use these. Children on haemodialysis may be able to get the EPO injections during the dialysis session. This is a procedure to receive healthy blood from a blood donor. It may be needed for children with more serious anaemia. A transfusion usually takes a few hours, and blood is given through a plastic tube in the vein. A special gel or cream can be used to help your child stop feeling any pain. In CKD, there may be an imbalance of chemicals (electrolytes) in the blood, because the kidneys are less able to control the amounts of these. This may lead to serious and potentially life-threatening complications. • hypercalcaemia – high levels of calcium. To reduce these serious risks – both in childhood and later in life – your child needs to carefully follow the treatment plan set by your doctor. This will probably include restricting which foods he or she can eat, and taking medicines. It is crucial to do this – especially as there are often no symptoms or warning signs. Hyperphosphataemia and hypocalcaemia may cause the bones to become less strong and so they may not grow normally. This is called renal bone disease (renal osteodystrophy). • The kidneys are less able to remove phosphate into urine. This means there is a high level of phosphate and a low level of calcium. This triggers the body to release parathyroid hormone (PTH). PTH is a type of hormone, which is a chemical that is carried in the blood to send messages to other parts of the body. • PTH increases calcium in the blood by removing it from the bones, causing renal bone disease. • an imbalance of calcium and phosphate – which causes the blood vessels to get stiff, and makes it more difficult for the blood to circulate. In serious cases, hyperkalaemia can cause a cardiac arrest, a life-threatening emergency in which the heart suddenly stops pumping blood. PTH is a hormone that is released into the blood stream by the parathyroid glands, which are in the neck. Both PTH and vitamin D work with chemicals such as calcium and phosphate for bone development and growth. In later stages of CKD, some children have too much PTH. If this happens, your child may need medicines to keep PTH at the right level. Kidneys with CKD are less able to remove phosphate from the body, which can increase the risk of bone problems. Phosphate binders – (e.g. calcium carbonate, Tums, sevalemer (Renagel) – bind phosphate from food in your child’s gut, so that less gets into his or her blood. In stage 5 CKD, when the kidneys are in failure, children usually need specialist treatment, such as dialysis and/or a kidney transplant. Children start preparing for one or both of these treatments in stage 4. Dialysis uses special equipment or a machine to remove extra water, salts and waste products from the blood. Dialysis can only work as well as 10–15% of two healthy kidneys, and it cannot do everything that kidneys do – such as produce the hormones that help activate vitamin D or make red blood cells, so your child will continue to need a special diet and medicines when they are on dialysis. There are two main types of dialysis – haemodialysis (blood is cleaned in a large machine) and peritoneal dialysis (dialysis fluid is placed inside your child’s abdomen (tummy) where the body’s natural filter removes water and waste products, and then the dialysis fluid is removed and replaced with fresh dialysis fluid). Your child’s healthcare team will give you information so you can help decide the best type for your child. Each type of dialysis needs a small operation before dialysis can start. This surgery creates access to your child’s body so the dialysis can work. A kidney transplant is currently the best treatment for almost all children with ERF. After a successful transplant, children can live healthy lives and feel much better. A new kidney may work for many years. Kidney transplantation is major surgery. A healthy kidney is removed from one person (a donor) and placed in the body of another person who needs it (a recipient). Children need to have many tests before the operation, and may need to wait for up to a year or longer before a suitable kidney becomes available. They will need to stay in hospital for ten days or longer after the surgery, to recover and check that their new kidney works well. They will also need to take medicines every day, go to follow-up appointments and take care of their health after the transplant. Sometimes, a kidney transplant can take place before a child needs dialysis. This is not always possible and depends on many factors, including the availability of suitable donors. Most children can have a kidney transplant, though those under 2 years of age usually need to wait until they are big enough for the operation. Children may need further kidney transplants, dialysis or other care later in life. This is the end of the introduction to chronic kidney disease. If you would like to read more about other later stages of CKD, tests and diagnosis, treatment or supporting information, you can find a list of topics covered on the infoKID website at www.infoKID.org.uk.